Capricornus, the Water Goat, appears as something of an upside-down old fashioned hat. Algedi is the bright star just above far-right center. Its elongated shape is the result of its being a naked-eye double star (the duplicity only an illusion as the two stars are just accidently lined up). Dabih is just down and to the left of it. At the left end of the figure is the Water Goat's tail, Deneb Algedi, the star at the upper left corner. Nashira is just down and to the right of it. Down and to the right of Nashira are Epsilon and then Zeta (the brighter of the close pair), while Omega is near the bottom edge. Psi is up and to the right of Omega. Theta Cap lies just up and to the left of center. Nu is just to the left of Algedi. 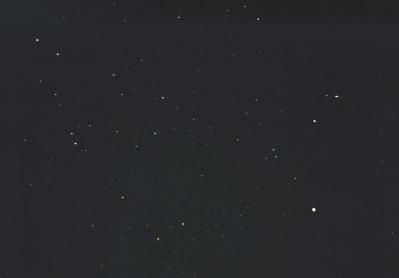 Down and to the left of Beta is a small triangle made of Pi (lower right), Rho (upper left), and Omicron (lowerr left). Far western Aquarius lies above Capricornus, represented by Albali (Epsilon Aqr, the brightest star near the upper right edge) and by Mu (up and left of Albali) and Nu (directly left). A view shifted to the east shows fainter stars. The bright "star" toward the lower right is the planet Saturn, which was moving through the constellation when the picture was taken. Other views of Capricornus show Saturn gone and replaced by Uranus and Neptune.